Being overweight or obese is associated with a range of health complications. It is well publicized that these weight aberrations contributes to some of the most common diseases that leads to death across the globe, especially cardiovascular diseases. Understanding what being overweight or obese means, how it occurs and the potential dangers is therefore important for every person. It is important to understand the concept of body mass index when discussing being overweight or obese. The body mass index or BMI for short is the height to weight ratio. Humans should be within a certain weight bracket for their height. Although the BMI is not a very accurate indicator for people who are very muscular and young children, it is useful for the majority of adolescents and adults. Sometimes it is further clarified as a BMI of 40 or more being morbid obesity. Body mass index correlates with body fat percentage. It means that a person with a higher BMI due to a higher body weight has a higher body fat percentage. The latter can be measured but fat is not always distributed equally throughout the body so directly measuring it can lead to some fluctuation depending where the measurement is taken. BMI and body fat measurements should be used together. Overweight is when your BMI is from 25 to 29.9. This means your body weight is too high for your height and you are at risk of health complications from the excess weight. This risk is not as great as being obese but is nevertheless significant. Being overweight is a transition to obesity and if the behavior that contributed to the weight gain goes unchecked a person will become obese. Obesity is when your BMI is 30 or more. It is a high risk state where your body weight is excessive for your height and frame, well beyond just a slight elevation. Most people do not become obese overnight. There is a gradual increase in body weight within the normal range, then through the range defined as being overweight and eventually reaching obesity level. Gradual and progressive weight gain is usually due to fat accumulation. Although body fat is a normal feature in healthy individuals, excessive body fat is associated with health risks. Fat is the ultimate storage form for nutrients. Both carbohydrates and proteins, the other two macronutrients, can be converted to fat if necessary. Fat is a consequence of consuming too many calories. In other words it sourced from food. All foods have an energy potential when it is broken down and used for the body’s metabolic needs. This is denoted in calories or kilojoules. Consuming foods with too many calories will cause the body to store away the excess in glycogen or eventually as fat. While hormonal factors can contribute to an increase in body weight as is seen with hypothyroidism, the body still requires calories intake through food to produce this fat. Excess food calorie intake can be countered with physical activity where the body has to consume more calories for the energy needs like during exercise. Therefore weight gain is consequence of excess calorie intake (food) in the face of insufficient calorie utilization (physical activity). People who live a sedentary lifestyle and consume a diet of high calorie foods are therefore more likely to gain weight and be overweight or obese as compared to a person who is physically active like with dedicated workout sessions or those who consume a low calorie diet. How many calories is too much? 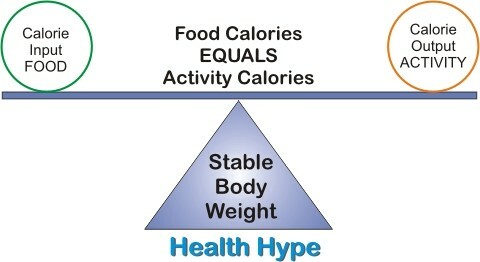 A person’s daily calorie needs varies. A certain number of calories is necessary to maintain life functions as all cells in the body need to produce energy. The level of physical activity in a day further requires calories. As a general guideline, the average adult male requires about 2,500 calories in a day whereas an adult female requires about 2,000 calories in a day. Even during sleep the body is utilizing calories and this is known as the resting metabolic rate. The metabolic rate varies from one person to another. People with a higher metabolic rate would consume more calories even at rest than a person with a lower metabolic rater. Ideally a person would consume the same amount of calories as their body requires in a day. The body does not waste excess calories. Instead it stores it away in different storage forms. Glycogen is one such storage form but the body has a limited capacity for glycogen. The same does not apply to fat. It is a more efficient storage form and the body can keep accumulating fat if necessary. However, this could be prevented by consuming the same amount of calories as is needed by the body in a day to maintain life and physical activity. Similarly excess body weight can be reversed by consuming less calories than is needed daily thereby forcing the body to utilize its fat stores. Medical science is constantly identifying more diseases in which being overweight or obese can increase the risk of these diseases occurring. However, the most well known of these conditions is cardiovascular disease. Obesity contributes to it directly and indirectly. For example, obesity increases the risk of atherosclerosis but it also increases the risk of diabetes which in turn increases the risk of cardiovascular disease. The list is extensive and it is possible that there are many more diseases where obesity plays a role although it is not yet known. Irrespective of the number of conditions, the important aspects is that being overweight or obese increases the risk of various diseases and should therefore be reversed (weight loss) as soon as possible.